A new Lowell Observatory meteor-tracking camera system, made up of 16 video cameras, is ready to watch the 2018 Perseid meteor shower's peak from Meteor Crater in Arizona. Scientists are hoping to see one of the year's best meteor showers from one of the most scenic places on Earth: Arizona's Meteor Crater. Astronomers with the Lowell Observatory in Arizona have activated a new meteor video surveillance system at Meteor Crater (formally known as Barringer Crater) just in time for the 2018 Perseid meteor shower this weekend. 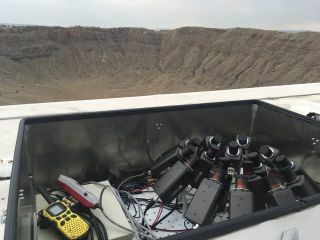 The new tracking system at Meteor Crater will observe Perseid meteors using 16 video cameras that will watch the entire night sky. Meteor Crater is about 35 miles east of Flagstaff, Arizona. It was caused by the impact of an asteroid 164 feet (50 meters) wide hit the Earth 50,000 years ago. "The cameras pinpoint recovery locations for large meteors that impact Earth," Nick Moskovitz of Lowell Observatory said in a statement. "Our goal is to discover new meteor showers and better understand meteors and their link to asteroids and comets in the solar system." Moskovitz leads the Lowell Observatory CAMS project, or LO-CAMS, which is part of the larger Cameras for All-sky Meteor Surveillance (CAMS) project led by meteor astronomer Peter Jenniskens of the SETI Institute and NASA's Ames Research Center in Moffett Field, California. CAMS meteor-tracking systems use a network of 16 video cameras per location instead of a single all-sky camera with a fish-eye lens to track meteors. "Because this approach uses much more sensitive cameras, trajectories for hundreds of meteors per night are calculated and posted almost immediately on the web," Moskovitz said. "And by measuring these trajectories at high precision, we are able to determine where they came from in the solar system." The new LO-CAMS system is the second built by the Lowell Observatory. The first is at the observatory itself in Flagstaff, Arizona. Meteor Crater Enterprises, which oversees tours and other facilities at Meteor Crater, funded the new meteor-tracking station. If bad weather spoils your Perseid meteor shower this weekend, you can watch the a live webcast here, courtesy of the astronomy broadcast service Slooh. The 6-hour webcast begins at 5 p.m. EDT (2100 GMT) and you can watch it directly on Slooh.com.